Kingston did what was inevitable - RGB LED lighting on SSDs, the least showy components of any PC build. The new HyperX Fury RGB series SSDs feature RGB LED lighting elements in the form of two diffusers and the HyperX logo. The drive is build in the 7 mm-thick 2.5-inch form-factor, with SATA 6 Gbps interface. In addition to the SATA interface, the drive has a micro-USB 2.0 port, and in included cable that connects it to a USB 2.0 header of your motherboard. This USB connection is needed to let you control its LED lighting. 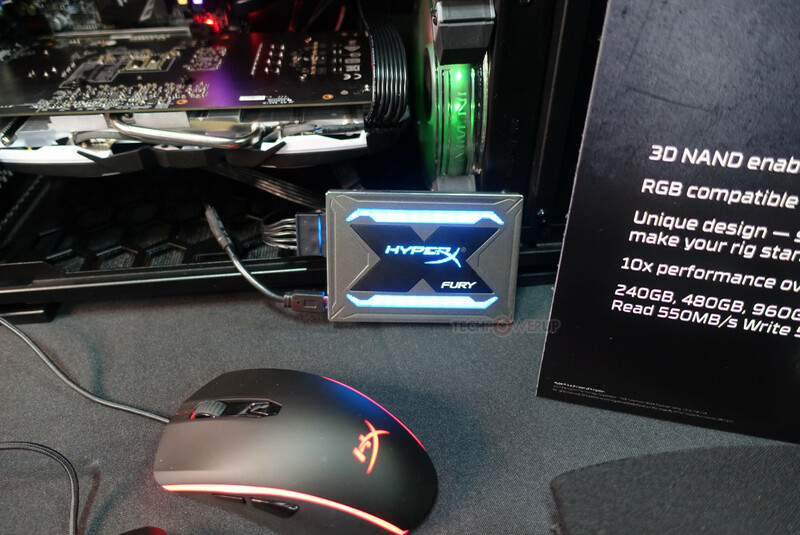 In addition to Kingston's own HyperX app, in addition to industry standards such as ASUS Aura Sync RGB, and GIGABYTE RGB Fusion. As a drive, the HyperX Fury RGB retains the feature-set of the HyperX Fury. It comes in capacities of 240 GB, 480 GB, and 960 GB; and implements 3D MLC NAND flash memory. It offers sequential transfer rates of up to 550 MB/s reads, with up to 520 MB/s writes. Now I wanna see RGB HDD. You know, with actual RGB on the disks and heads, and a transparent window to show it off in a vertical HDD mount. Also the RGB can sync with your disk activity. Just kidding, this ir ridicilious and braindead, no offense to who loves the idea of RGB on HDD, SSD. But still youngsters will go like - OMG, can you see those lights, how it shines and blinks, this SSD will be the fastest in world. And his ECO will grow :D.